While temperatures and climate across the Bay Area came across as cold and gloomy over the holiday weekend, freshman Anna Bright was as hot as a pistol. Leading the No. 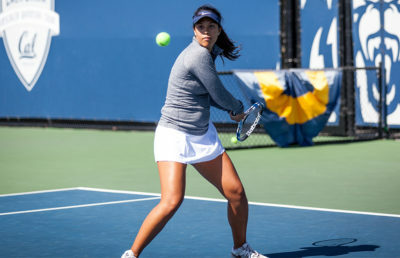 11 Cal women’s tennis team in the Bears’ annual Cal Winter Invitational, the No. 27-ranked singles player continued her strong start to the spring season with both the singles and a share of the doubles’ title in the top flight bracket. The team as a whole started and ended the tournament on a high note, collecting eight match wins during play both Friday and Sunday, but it ran into bumps in the road midday Saturday. Still, early-season struggles can patently be viewed as solid checkmarks for the long-term growth of head coach Amanda Augustus’ players, especially the still-developing underclassmen. In a field that featured the host Cal along with Cal Poly, Fresno State and NorCal rival St. Mary’s, the Bears’ Friday matchups included the Mustangs in singles and Gaels in doubles. By sundown, only senior Audrey Mayer had lost on a court featuring a blue, white and gold uniform. Leading the overpowering performances over Cal Poly were Bright and freshman Julia Rosenqvist. Rosenqvist handled fellow freshman MacKenzie Worsnop with a 6-0, 6-2 win, while Bright made easy work of sophomore Susanne Boyden, 6-1, 6-1. A few courts over, freshman Jasie Dunk, sophomore Alexis Nelson and junior Maria Smith capped off the impressive 5-1 singles day to start the invite. But for as hot as they began, the Bears kicked off Saturday with an unsettling start, struggling to hit the ball as cleanly as the day before. 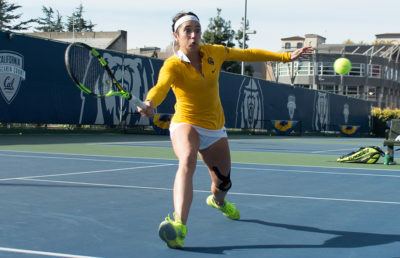 Losing six of their first nine overall singles sets, several Cal players found themselves rallying to escape past their Fresno State singles opponents. Despite the slow beginnings, Rosenqvist and Smith found their footing and defeated junior Emma Wilson and sophomore Juliane Triebe, respectively. Saturday’s doubles matchups, however, saw few tactical errors from a pair of Cal’s strongest duos. Bright and Rosenqvist breezed past Mustang senior Molly Reed and sophomore Seriana Saltzen, 6-2; meanwhile, Smith and junior Olivia Hauger produced a perfect 6-0 win over Worsnop and Boyden. Leave it to the veterans to show the freshmen what a wire-to-wire doubles win looks like. On the final day of play, the tournament concluded the way it started — and as the spring season as a whole began. Having muscled their way into the final, Bright and Rosenqvist squared off with Wilson — one of Rosenqvist’s singles matchups — and sophomore Georgia Lawson of Fresno State. The midday match once again fell the Bears’ way 6-3, but Bright wasn’t finished for the day. With all eyes on the Hellman Tennis Complex’s court one, the freshman went to work one last time, defeating St. Mary’s freshman Maria Kozyreva, 6-4, 6-1, to take home her second singles title in as many weeks. Make it back-to-back Cal Winter Invitational title sweeps for the Bears, as Bright pulled off the same feat that All-American Maegan Manasse did last year at this time, winning both the singles and doubles flights. Fortunately for Bright and Cal, the team’s next tournament is the ITA Kick-off Weekend event, also in Berkeley and beginning Jan. 26. With their freshmen exceeding expectations, the Bears will hope that the two-week layoff doesn’t cool them down.